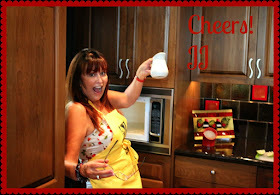 Sew what's cooking with Joan! 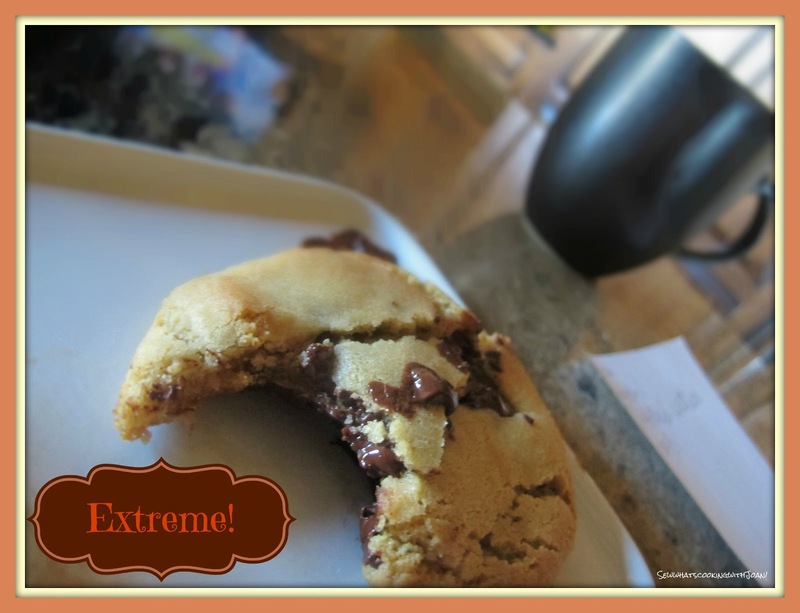 : Extreme Chocolate Chunk Cookies! The other day I whipped up a batch of these Chocolate Chunk cookies. Our nephew was flying in from California, and I thought they would make a nice snack when he arrived. 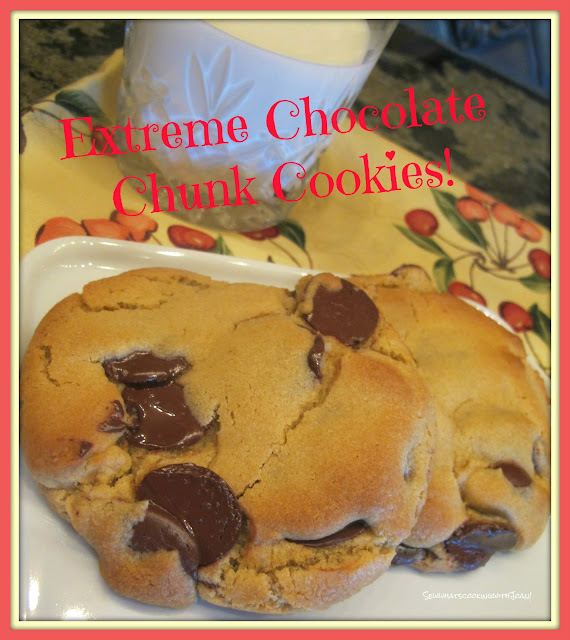 These are for serious cookie connoisseurs! A friend of mine, Mojdeh, gave me this cookie recipe a few weeks ago, she got it from a friend who made it from Saveur magazine. They're absolutely over the top delicious!! And they were one of Saveur's top 150 recipes. They're basically 9 ounces of rough chopped chocolate in between three layers of cookie dough...........trust me, you will die and go to heaven with the first bite! Ed, our nephew said, "they are moist and fudgy like brownies, layered with chunks of chocolate, with a slight crisp outside!" And they are! Moist and tender inside, and so marbled that every bite contains the consummate balance of sweet dough, melting bittersweet chocolate, and crystalline salt.....mmmm You can't miss with these! Heat oven to 375 F. Whisk together the flour, baking soda, and salt in a bowl; set aside. Combine the butter, both sugars, and vanilla in a large bowl; beat on medium high speed with a mixer. until smooth and fluffy, about 3 minutes. Add yolks two at a time. beating after each addition; add dry ingredients; beat on low speed until just combined. 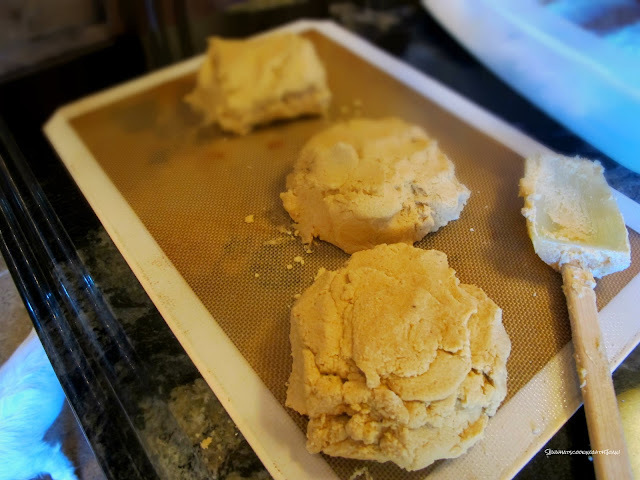 Transfer dough to a work surface; divide into 3 equal pieces. Flatten each into a 4X6 inch rectangle; wrap in plastic wrap. Chill for 30 minutes. 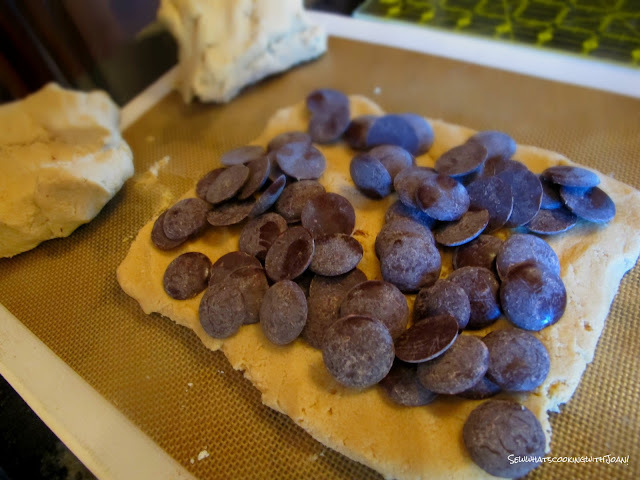 Place one dough rectangle on a floured work surface; sprinkle with half the chocolate. Top with another rectangle, sprinkle with remaining chocolate, and cover with last rectangle. Using a floured rolling pin, flatten rectangles into a 9 X 6 X 1 1/2inch rectangle. * Have you ever opened your box of chocolate and found that it had developed an odd looking grey color on the surface? Did you throw it out, because you thought it had gone bad? You didn’t need to, because that happens when some of the butterfat in the chocolate migrate to the exterior. It is perfectly fine to use, it just isn’t as attractive as fresher chocolate. 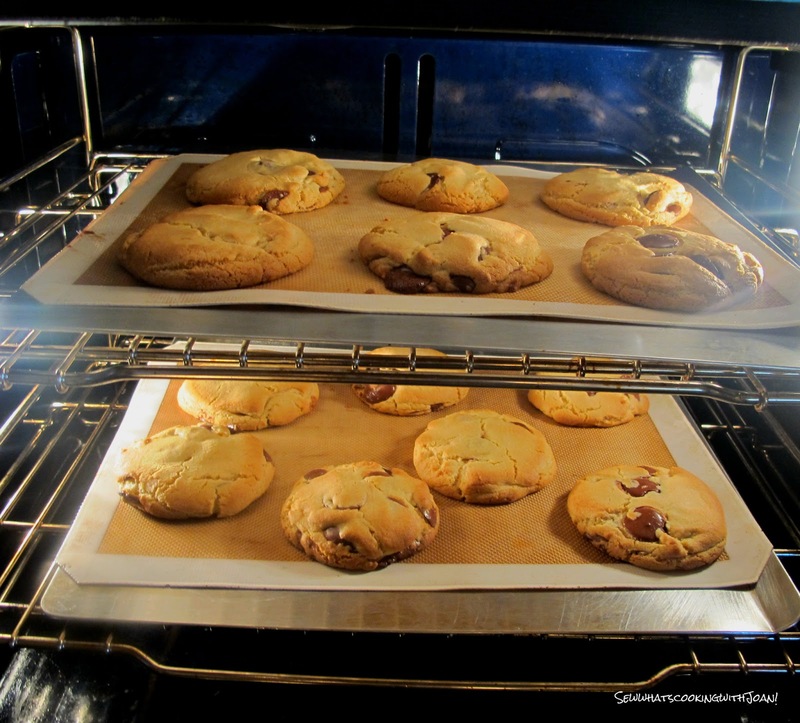 I use that chocolate in recipes that call for melting it, such as ganache or in these cookies, where it melts in the oven. Using a 2 inch round cutter, cut out the cookies; transfer to parchment paper or silt pat lined cookie sheets, space 3 inches apart. Ruth put on your blindfold! 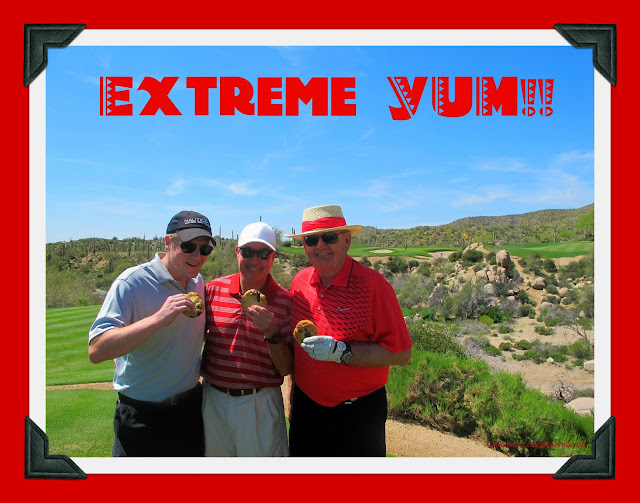 Ed, Wee Bear and Jim enjoyed a mid round treat of Extreme Chocolate Chunk Cookies! We had a great time on the golf course with our nephew and can't wait for him to visit again! Hopefully next time with his new bride, Jenny! Chocolate lovers take heart! Findings reveal that dark chocolate is packed with high-quality polyphenol antioxidants that may promote overall cardiovascular health. Cocoa beans also contain flavonoids (like those found in tea and red wine), which promote healthy cholesterol levels and act as antioxidants. Great news! A sweet side note: As if that wasn’t enough to convince you to dig in, chocolate also provides a slew of daily nutrients. A 1.4-ounce milk chocolate bar contains about 3 grams of protein, 7% of the adult daily value (DV) of riboflavin, 8% of the DV for calcium and 5% of the DV for iron. However we know the darker chocolate has the most benefits! This little netted basket I found at Bed, bath and beyond. 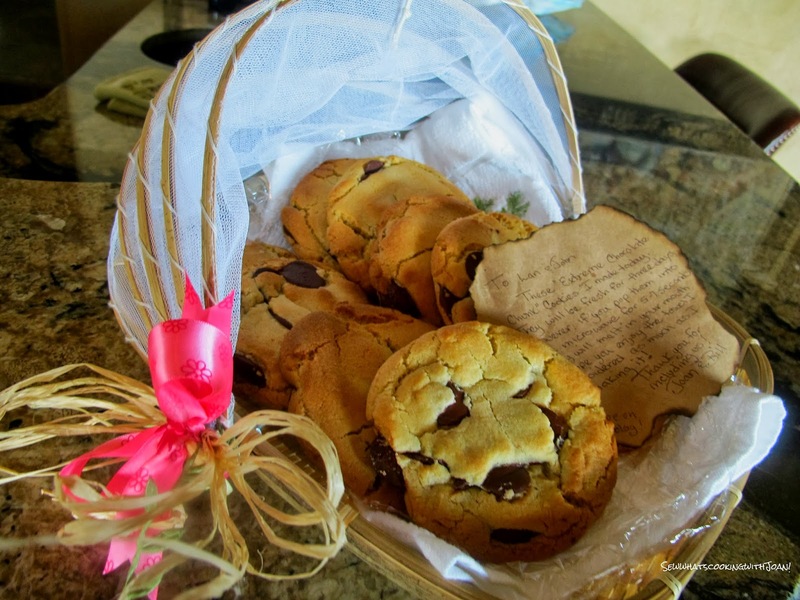 I thought it perfect to protect the Extreme Chocolate Chip Cookies in transport to a friends home. The perfect gift for many occasions, and please note this little basket looks like a bassinet! A baby shower idea! Make this glutin free flour blend and keep it in a tub. Use this in place of the all purpose flour! In large bowl, mix all ingredients with whisk until fully incorporated. Transfer to storage container; seal tightly. Store in cool, dry place or in refrigerator. Before using, stir to blend the flours and xanthan gum. I am glad everyone is enjoying these as much as I did! I have received at least 20 comments! Mostly e-mail! A nice treat!